Neighbourhood Houses are known as places to connect, volunteer, and become involved in the community. Many people do not realize the important work that neighbourhood houses do to help people feel a sense of belonging. This is known as social inclusion, and is particularly important when community members are experiencing a challenge or barrier in their lives. When people feel socially isolated, they often experience negative impacts to their health and well-being. Our open doors and inclusive programs can make a tremendous difference and help people feel valued and motivated. houses through our collective work on social inclusion. Enjoy! Each month we will feature a story from a different neighbourhood house. This month, we are featuring South Vancouver Neighbourhood House in Vancouver’s East Side. Wing Sun is an older adult who was becoming very isolated at home. He was told by his doctor that it wouldn’t be long before he was wheelchair-bound. Hearing this, his case manager referred him to the Beulah Adult Day program at the South Vancouver Neighbourhood House (SVNH). While he was eager to get out of the house, Wing Sun was concerned about how he would get to Beulah as he would need to rest several times just to walk the short distance. Realizing this, the program staff helped Wing Sun arrange for the HandyDART bus service. When he was finally able to leave the house on his own, it didn’t take long for Wing Sun to start shining at the program. He was excited to be able to share his thoughts with this new group of people, and began to bring in newspaper clippings and articles about health, Feng shui, diet and current events. This helped him to easily start a discussion over morning tea with the other participants. In 2014, Helen, who is legally blind, also began visiting the day program. Wing Sun formed an instant friendship with Helen, as she also greatly enjoyed discussing health and herbal medicine. Each week, the two of them can be found sitting together and chatting over a cup of tea. In the mornings, Wing Sun helps Helen to read the lunch menu and places her order. They are rarely far apart while at the centre; and although they both face their own physical challenges, they bring a lot of joy to each other. 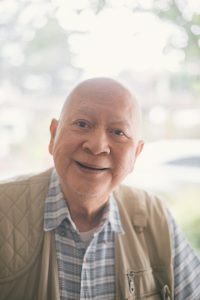 The friendships that Wing Sun has made at the Beulah Adult Day Program have motivated him to keep attending throughout the years, and have kept him physically active. Exercising with the other seniors has kept him strong and able-bodied so that now – almost five years later – he still doesn’t need to use a wheelchair.